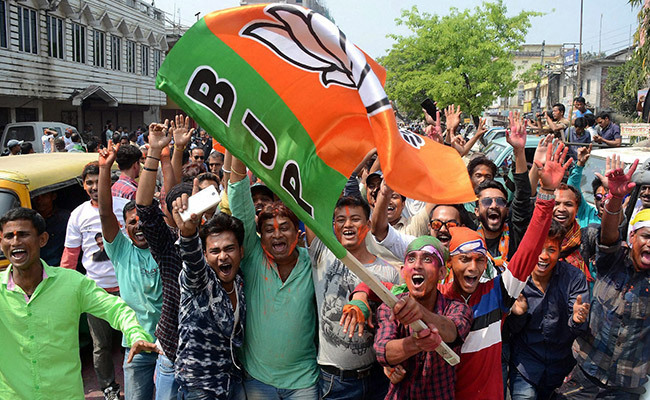 The BJP Thursday released its third list of 32 candidates for the Madhya Pradesh Assembly election slated for November 28, fielding Akash Vijayvargiya, the son of the party’s national general secretary Kailash Vijayvargiya, from Indore-3 seat and former minister Rakesh Choudhry from Bhind. With this list, the party has so far released the names for 226 seats in the 230-member MP House. The party has fielded former Bhopal Mayor Krishna Gaur from Govindpura seat of Bhopal in place of former chief minister and her father-in-law, Babu Lal Gaur. It has denied a ticket to minister of state Surya Prakash Meena from Shamshabad seat in Vidisha district. Akash Vijayvargiya is contesting his maiden election, and has been fielded from the tough Indore-3 seat which has a sizable population of the minority community. The party’s fiery leader, Usha Thakur, who had wrested the Indore-3 seat from the Congress in 2013 Assembly polls has been shifted to Mhow seat, also in Indore district. Mhow seat is currently held by Kailash Vijayvargiya. Mhow is the birth place of Dalit icon B R Ambedkar. Choudhry Rakesh Singh has been nominated from Bhind. Ajit Borasi, the son of former Congress MP Premchand Guddu who joined the BJP recently, has been fielded from Ghattiya (SC) seat in Ujjain district in place of Ashok Malviya who was given the party ticket in the first list announced on November 2, party sources said. Ghattiya seat at present is represented by Satish Malviya of the BJP who has been denied a ticket this time. From Rajpur seat in Barwani district, the BJP has fielded Antar Patel in place of his father Devi Singh Patel, who was declared as the party candidate in the first list but died recently. Among the 32 names announced Thursday, the BJP has dropped its sitting MLAs Narendra Singh Kushwah from Bhind, Babulal Gaur from Govindpura, Mukesh Choudhry from Mehgaon, Kailash Vijaywargiya from Mhow, Satish Malviya from Ghattiya, Ghanshyam Pironiya from Bhander (SC) and Sanjay Sharma from Tendukheda. Sanjay Sharma had joined Congress recently. The other sitting MLAs who have been dropped are Govind Singh Patel from Gadarwara, Suryaprakash Meena from Shamshabad, Inder Singh Parmar from Kalapipal and Shantilal Bilwal from Jhabua. “Now only six seats are left for which the BJP has to declare candidates. These are Panna, Lakhnadoun, Seoni Malwa, Bhopal North, Mahidpur and Garoth,” state BJP spokesperson Sarvesh Tiwari said. The party has reposed faith in 11 sitting MLAs by renominating them from the respective seats they won in 2013. These include Anil Jain from Niwadi, Lakhan Patel from Patharia, Moti Kashyap from Badwara, Arun Bhimawat from Shajapur and Rajendra Verma from Sonkutch. The other sitting MLAs to be have been renominated are Manoj Patel from Depalpur, Sudarshan Gupta from Indore-1, Ramesh Mendola from Indore-2, Indore Mayor Malini Gaud from Indore-4, Mahendra Hardia from Indore-5 and Rajesh Sonkar from Sanver.